The origins of this medieval castle are shrouded in mystery, however, it is generally believed that it was first built in the 14th century. It has gone through countless renovations with the last one being the most extensive. It was Archduke Ferdinand d’Este, the successor to the Hapsburg throne, that gave it this last makeover. Until his assassination in Sarajevo on 28th of June, 1914, which is generally seen as the catalyst that started WWI, he lived here with his lovely wife Sophie and their children. The castle has become a museum for the art object that he and his family collected over centuries. 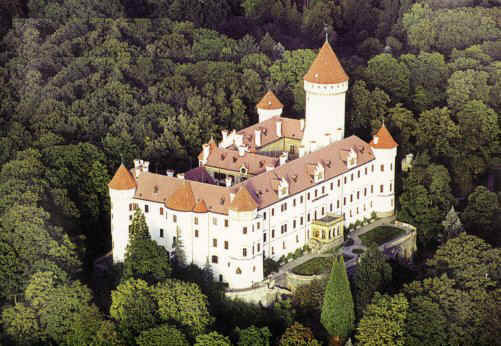 The castle is located approximately one hours drive south of Prague in a pristine, woody area, near the town of Benešov. After we pick you up in your hotel, we drive to the castle park area where you start your walk to the castle. After the ca. 20 minute walk, your English speaking castle guides will take you on a castle tour. 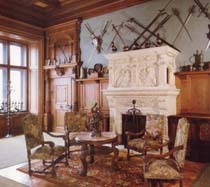 During your tour you will see antique furnishings, paintings, tapestry, hunting trophies and much more. The castle bears are also waiting for your visit. Konopiste castle is closed every Monday and limited opening in the winter. Please inquire.